"All the girls were much smitten with the new drug clerk. Among them were two sisters who had a wealthy uncle. He offered $10,000 apiece if they would get married within a week. The thoughts of the sisters naturally flew to the young druggist. One night someone rang the night bell. When he opened the door the determined one grabbed him, intending to carry him before the minister. Her plot failed, for her sister took the weeping druggist to the parsonage. The druggist certainly was in a dilemma. Through the telephone he got into communication with a large determined-looking woman who hurried around to the house. But when the stranger came into the room the druggist hailed her with cries of joy, and turning to the others he simply said: 'I cannot marry either of you - my wife won't let me.'" "This is a genuine leap-year offering in which two sisters, one thin and the other fleshy, are promised by their rich uncle $10,000 each if they are married within the week. 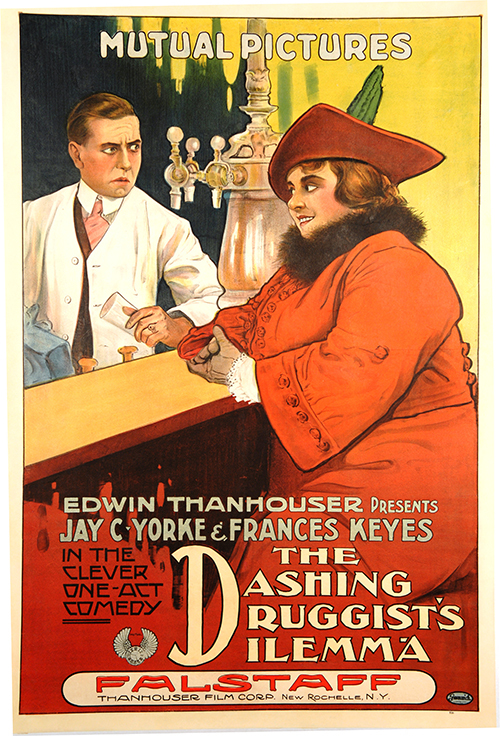 They both have an eye on a dashing young druggist, who is kidnapped in the night by the one who has had foresight enough to buy her license beforehand. The other tries to overcome the situation by stealing her sister's auto and arriving at the minister's with the man. In the time consumed in a return trip for the license, the man's wife, who was not known to exist, appears on the scene."